In mid-March, Superintendent Dr. Jesus F. Jara awarded the first Superintendent Challenge Coins to a dozen deserving Clark County School District employees. 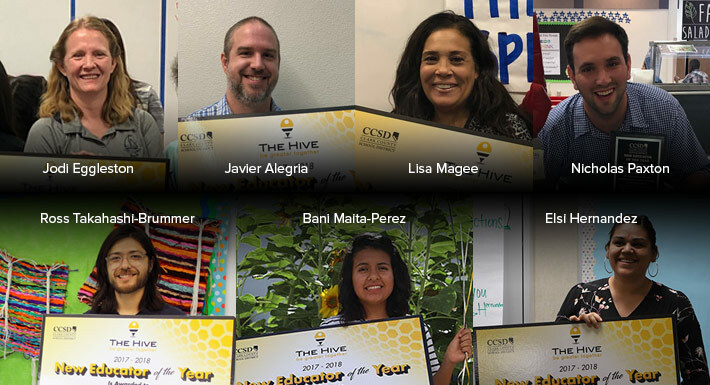 He surprised dedicated, hard-working CCSD employees who have demonstrated going above and beyond in making CCSD number one for kids. 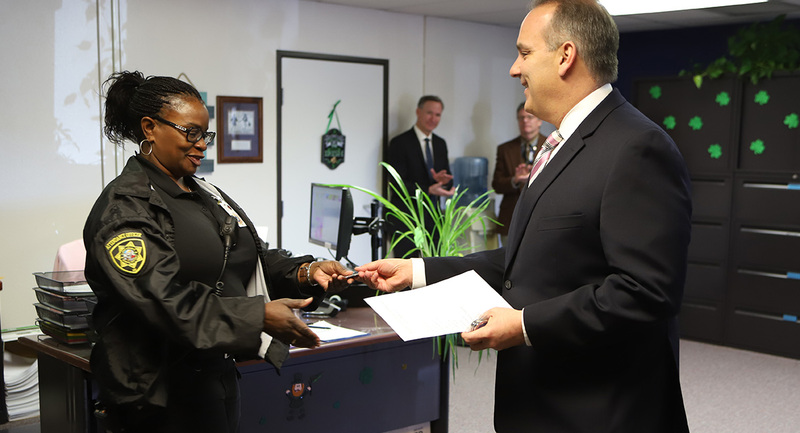 His first stop on March 14 was at the Education Services Division, where he distributed the Superintendent Challenge Coins to 11 CCSD employees who volunteered to stay late on Feb. 21, when Safekey programs closed early due to inclement weather. Later that morning, Dr. Jara visited Ethel W. Staton Elementary School to surprise kindergarten teacher Nikki McGuire, who had recently been profiled in a Las Vegas Review-Journal story for her commitment and love of teaching while fighting chronic myeloid leukemia since 2009. For the 20th consecutive year, the Clark County School District Music Education Program has been honored with the Best Communities for Music Education designation from the National Association of Music Merchants (NAMM). 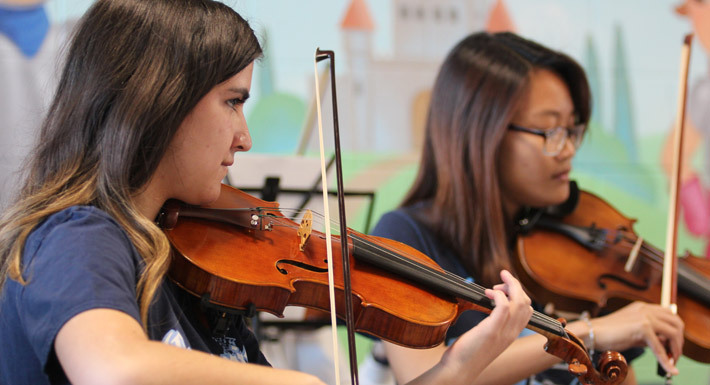 Districts that have been recognized by the NAMM are often models for other educators looking to boost their own music education programs. 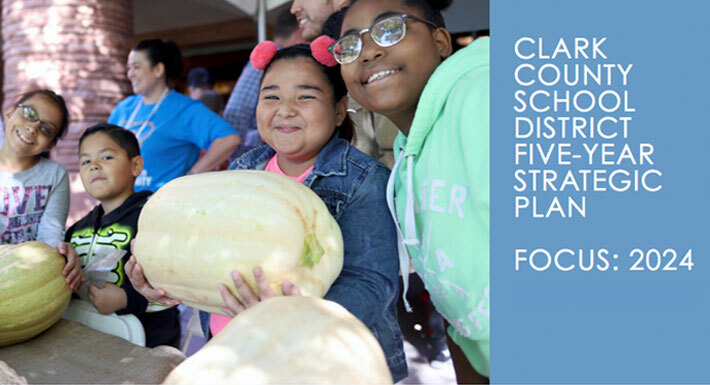 To qualify for the Best Communities designation, CCSD answered detailed questions about funding, graduation requirements, music class participation, instruction time, facilities, support for the music program and community music-making programs. Responses were verified with school officials and reviewed by the Music Research Institute at the University of Kansas. CCSD joins 623 districts across the country in receiving this prestigious award in 2019. Each school year the Clark County School District recognizes outstanding new educators. The award is to recognize and celebrate outstanding new educators – in a variety of categories – who have demonstrated excellence and dedication to students and the school community. To nominate an outstanding new educator, click here. The deadline to nominate someone is Friday, April 5, 5 p.m. Recipients of the award will have their picture displayed in the lobby of the Edward A. Greer Education Center. An administrator, colleague, community member, parent, or student can nominate new educators. A new educator is defined as someone who has no prior contracted experience and was hired during the 2018-19 school year. 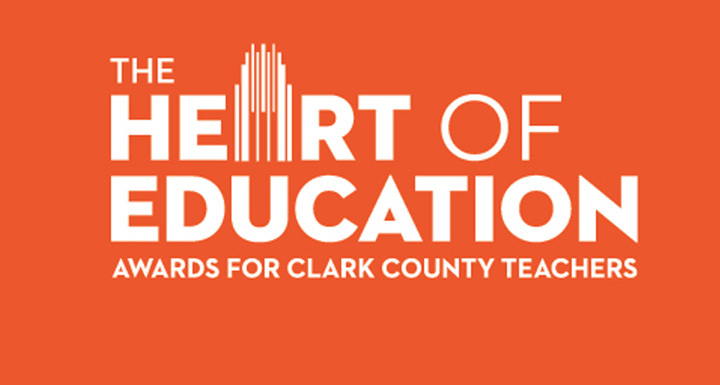 Over 720 Clark County School District teachers have been named finalists for the 2019 The Heart of Education Awards. The Heart Of Education Awards will honor CCSD teachers with an invitation-only event at The Smith Center, where 20 teachers will be selected to receive awards. The prestigious evening will feature a red carpet, swag bags for all of the invited teachers, and spectacular entertainment. Support for the event is provided by The Rogers Foundation and The Smith Center for the Performing Arts. Nominations for 2018-19 New Educator of the Year open March 1. The deadline to nominate a new educator is Friday, April 5, at 5 p.m. Click here to nominate a new educator, and for more information. Each school year, the Clark County School District recognizes new educators. A new educator is defined as someone who has no prior contracted experience and was hired during the 2018-19 school year. The purpose of the award is to recognize and celebrate outstanding new educators who have demonstrated excellence and dedication to students and the school community. Each recipient will have their picture displayed in the lobby of the Edward A. Greer Education Center. New educators can be nominated by an administrator, colleague, community member, parent or student. Administrators of selected recipients, in each category, will be notified the week of April 22. Recipients will be notified during Teacher Appreciation Week, May 6-10. 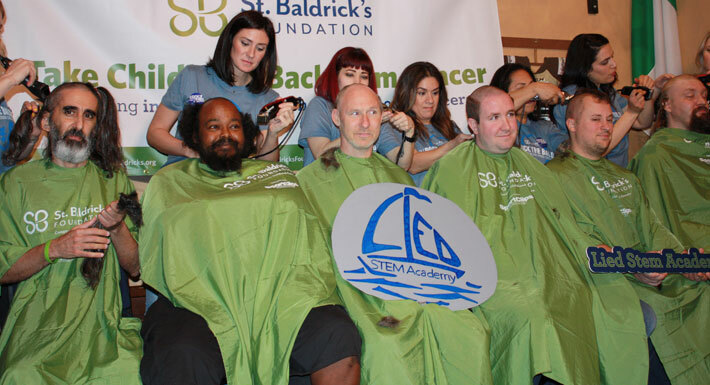 Over the weekend, Lied STEM Academy staff participated in the St. Baldrick’s Foundation head-shaving event at McMullan’s Irish Pub to raise money for childhood cancer research. Three teachers (Aramis Bacallao, Kyle Murrell and Peter Newman), one support staff (Clayton Kendrick) and Principal Derek Fialkiewicz had their heads shaved off. Leading up to the event, school staff collected donations from students, parents, community members, friends and family. Whoever donated the most money would be able to shave the first swipe off of Principal Fialkiewicz’s head. A student donated the most with $200. Students also raised $1,600 for an opportunity to shave the principal’s head during an assembly. In total, the Lied STEM Academy team raised over $5,000 for childhood cancer research and the donations are still coming in. Trustees said they appreciated the plan as a first step toward outlining clear goals to increase student achievement. “It’s a step in the right direction because it provides a blueprint for the community, the Board and the District,” said Board of School Trustees President Lola Brooks. For more information on the Feb. 28 meeting, click here. 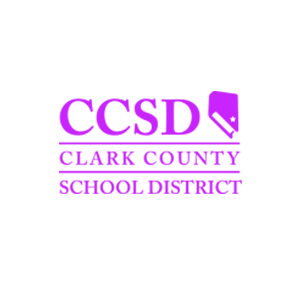 The Clark County School District (CCSD) is cancelling all school and after-school activities, including athletics and Safekey, on February 22, 2019 due to reports of potential freezing conditions on the roads that would be unsafe for school buses during the morning commute. All students are excused from school on February 22. The school day will need to be made up this school year. All CCSD teachers will be excused because they will need to make up the day with students at a later date. All nine-month support professionals, and support professionals on the 11-month Track S2, 11-month Track S5, 11-month Track E6, and 10-month Track S1 (School Aides) will also make up the day on a future date. CCSD administrators and all other support professionals are expected to report to work February 22, when they feel it is safe to do so. The National Weather Service has estimated that the roads will be free of ice by mid-morning. These employees may work with their supervisors to adjust their full work schedule to begin and end later in the day or utilize accrued leave. Should employees elect to take leave, it will be approved for any requested portion of the workday. School Police are considered emergency employees and will work their regular shifts tonight and tomorrow. Non-emergency employees who work the night shift today, Thursday, February 21, should end their shift at 6 pm and work their regular shift tomorrow. All CCSD schools and departments will operate as normal today throughout the county. Student and employee safety is our top priority and CCSD officials have consulted with local agencies and emergency managers throughout the county. All reports indicate that it is safe to drive on the roads. We will continue to monitor the weather conditions and keep our families and community up-to-date on any changes. We will determine by mid-day whether to have after school activities based on weather conditions. 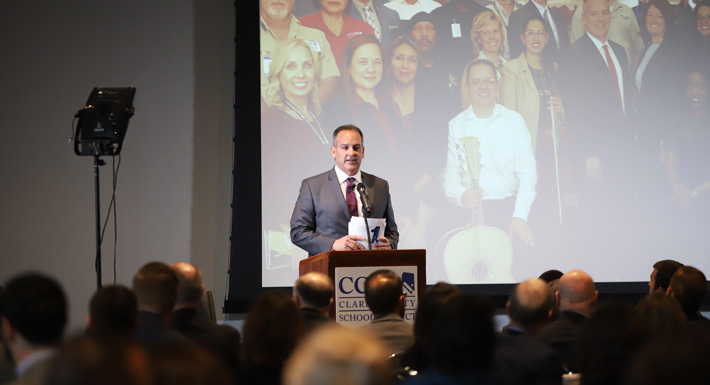 On Jan. 11, CCSD Superintendent Dr. Jesus F. Jara delivered his first State of the Schools address alongside Governor Steve Sisolak, members of the CCSD Board of School Trustees and Nevada System of Higher Education Chancellor Dr. Thom Reilly. Among other things, Jara announced that he and his leadership team have been working on a draft five-year strategy for the district called Focus 2024. It outlines a plan to achieve the goals the Board of School Trustees have laid out for the district over the next five years. These goals include a 90 percent graduation rate and a 100 percent increase in college and career ready diplomas. The State of the Schools address was delivered at the Thomas and Mack Center, with hundreds of community members in attendance. Click here for more details.